We still need your gifts in the door. Will you pitch in $3? Or is that to much too ask. Read This! Feeling fine is not the same as being healthy. As persons get older, they become more at risk for certain types of illness and diseases, and for men, who are three times less likely to see a doctor for any health related issue than women, this poses a serious problem. Regardless of whether or not you are in shape, you could still be suffering from heart disease or cancer, and by the time symptoms start to show, you have lost the window of opportunity for safe, effective treatment. Prostate, colon, rectal, pancreatic, and male breast cancer are some of the most pressing medical issues affecting men, and something needs to be done. There is still some stigma surrounding men and their health, whether it be in the form of an unwillingness to discuss it, or the feeling of being emasculated by needing to consult a doctor. It is time to put an end to this, and encourage men of all ages to seek medical support as they age, and become more vulnerable to conditions of the heart, lungs, prostate, and other organs. 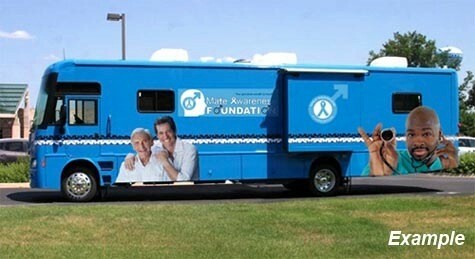 The Male Awareness Foundation was created in 2013, to help bring awareness to the health issues that affect men, and to encourage the pursuit of a healthier lifestyle through regular checkups and screenings. There are a lot of misconceptions surrounding illnesses that affect a high percentage of men, such as heart disease, which is the leading cause of death for men in the United States. Heart attacks aren’t always the sudden and severe chest pains seen in movies, and are sometimes so mild they can be mistaken for indigestion. Cancers are another silent killer that cannot be overlooked. Because men’s health is the main focus The Male Awareness Foundation, we want to take all the steps we can to make sure men across the country have the chance to take proactive steps to bettering their lives. It is with this mission in mind that we have begun raising funds to build a mobile clinic that will be able to travel to different towns and cities, and provide basic health tests and screenings. Some services that which will be provided are blood pressure and body mass index (BMI) testing, high cholesterol screenings, and other initial tests, the results of which will be discussed, and used to indicate if further examination by a specialist is needed. For those who wish to invest in our cause, we are looking to raise $55,000 to cover the cost of the vehicle, the modifications needed, and the equipment and testing materials. Even if you cannot donate at this time, your likes and social media shares of our campaign at www.gofundme.com/maleawarenessfoundation would be greatly appreciated. As a special reward, for those who donate $1000 or more, they will receive an autographed photo of Ice-T, and a Male Awareness Foundation t-shirt and wristband. Help spread the word. You never know who might see it and be able to donate. Thank you for taking the time to read this. You can find more information on our official website at maleawarenessfoundation.org. Feeling fine is not the same as being healthy. As persons get older, they become more at risk for certain types of illness and diseases, and for men, who are three times less likely to see a doctor for any health related issue than women, this poses a serious problem. Regardless of whether or not you are in shape, you could still be suffering from heart disease or cancer, and by the time symptoms start to show, you have lost the window of opportunity for safe, effective treatment. Prostate, colon, rectal, pancreatic, and male breast cancer are some of the most pressing medical issues affecting men, and something needs to be done. 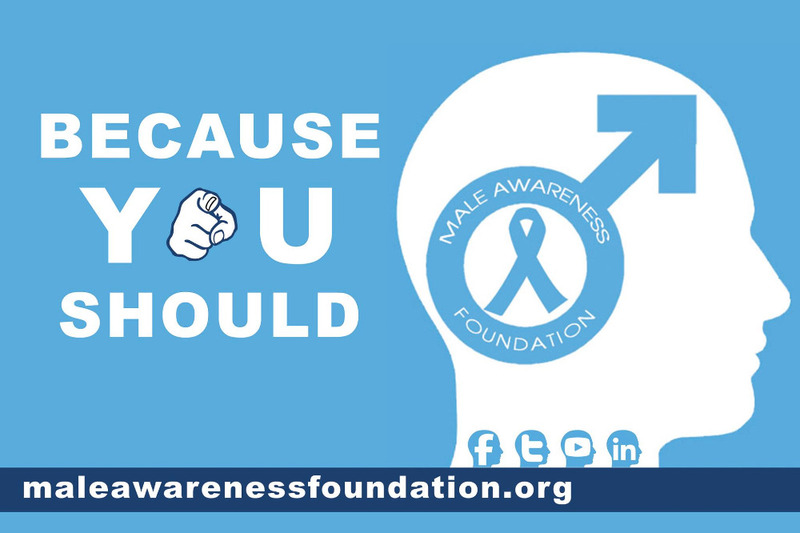 On behalf of Male Awareness Foundation, We deeply appreciate all your support . We thank you /Everyone for their generous donations. I've like to thank everyone who donated to our org. please share with a friend and spread the word . Once again our team will like to give thank's to everyone who have donated to this great cause. please tell a friend and spread the word. We love to thank everyone who has donated to this great cause . Please tell a friend who will tell a friend. we like to thank everyone who has donated. tell a friend to tell a friend and spread the word for the team will make a difference in the world for mens. We support our family at Male Awareness Foundation. Thank you to Mick Benzo for creating such a great organization to help all men live an healthier and active life! Get to a doctor and get checked out! Here is our 2nd donation and there are many more coming! I am asking all of my friends to give just $20.00 - help this great cause that I fully endorse. What is $20.00? Not even a round of drinks these days - heck I spent more at White Castle on a late night binge! (Don't tell anyone) $20.00 Donation will go a very long way! Exotics Rally supports this great Foundation. We know how important Male Awareness is these days. All men need to take care of themselves and get regular checkups with their doctors. Too many men avoid the doctor and find out issues when it's too late. Please help support by making a donation yourself today! Even if its only $20.00 - every penny counts! I am asking all my Facebook friends to please make an effort to support this foundation! I just wanted to say a personal Thank You to your organization for Getting Awareness out there for Prevention and Early Detections of Diseases..ESP for men getting their routine check ups to prolong their lives. Thank you !